Yesterday the U.S. Post Office officially announced there would be no more Saturday delivery. Today, I’m announcing the slow demise of e-mail too. There have been numerous recent articles that half of our work week is spent on something other than our real job. That something is almost entirely e-mail. While tens of thousands of postal workers lose their jobs even as the Post Office sinks further into debt, how many millions of people will lose their jobs over the next five years as e-mail slows to a trickle? Would you pay someone to only do half the job and how much better would the U.S. economy be, if we all used that extra time for more meaningful and productive tasks? If e-mail is the lifeblood of your daily routine, you need to become more self-directed rather than jumping every time there is an e-mail alert. You can Google various articles on e-mail etiquette and management, but the biggest step is eliminating the noise. If you use Outlook rules, you’re likely doing it wrong. By default, you can right-click on a message and create a rule to move to a folder, but you can end up with dozens of confusing rules that basically do the same thing making your mailbox slow to load. 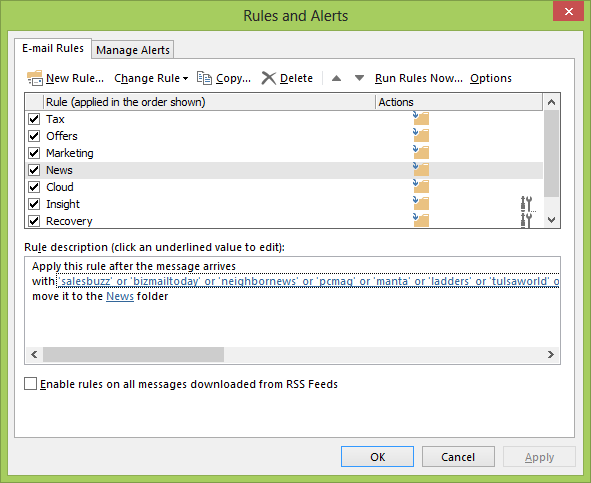 What about if instead you created a handful of key rules and then just added new senders? Anything I don’t want is of course trashed by the junk mail rule, but the news or offers of the day are automatically moved to corresponding folders. This same tactic is used for automated notices like Google Alerts for marketing. Instead of hundreds of e-mails hitting my inbox, I get a couple dozen that are resolved throughout the day. I run my inbox down to zero in less than 15 minutes each morning. I spend no more than 15 minutes scanning stuff filed for later, which must be extremely compelling, relevant, or unique for me to stop and read. While your competition slowly goes out of business wasting half their day on e-mail, go do something more interesting and helpful to others.